The new Southern Utah Museum of Art (SUMA) at Southern Utah University in Cedar City announces a "Call for Artists" for its inaugural 2017 biennial, national, juried art quilt exhibition. Artists from anywhere in the United States and its territories are invited to submit work for consideration by jurors Marilyn Badger and Sandra Hoefner. Deborah Snider, curator of the highly acclaimed 2012 international invitational art quilt exhibition at Southern Utah University, said "Visitors to the gallery in 2012 were astonished at the wide variety of art quilts, fabric collages, and embroidered artwork on display, and had no idea of the sophisticated vision of today's artists working in fibers and fabrics." While there is a strong tradition in southern Utah for traditional quilt making, artists are increasingly involved in art quilting. This exhibition will be held from June 30 through August 26, 2017 at SUMA, a state-of-the-art facility with 600 linear feet of exhibition space in a 6,000 square foot gallery. The online entry site will open on November 1, 2016, with a deadline for submissions of February 1, 2017. Accepted artists will be notified by March 15, 2017. A catalog will be produced for the exhibition, with commentary by the jurors, who will also award monetary prizes. Juror Marilyn Badger has produced award-winning quilts since 1991, including numerous Best-of-Show awards around the country and Best Longarm Quilting Awards at all three American Quilter's Society shows held in Paducah, Nashville, and Des Moines. She and her professional quilting techniques have been featured on over 60 PBS quilting shows with Fons and Porter and Kaye Wood, as well as “Quilt Central” with Donna Wilder and Janie Donaldson and HGTV’s “Simply Quilts” with Alex Andersen. Marilyn’s work has also been featured in many national and international quilting books and magazines. After teaching longarm quilting classes for 11 years in her studio as well as in the United States, Canada, Australia and Japan, she now serves as a consultant to APQS and has been an active participant on their behalf at major national and international quilt shows. Juror Sandra Hoefner currently lives in Grand Junction, Colorado after nineteen moves as a military spouse. She holds a Bachelor of Fine Arts in painting and ceramics from the University of Alaska, Anchorage, and a Master of Fine Arts in drawing, painting, and mixed media, which includes fiber and assemblage, from the University of Alaska, Fairbanks. Sandra has shown her art quilts internationally and nationally in popular juried exhibitions such as the International Quilt Festival in Houston and the American Quilter’s Society show in Paducah, Kentucky; “Earth, Fire and Fibre,” in Anchorage and “Interior Artisans” in Fairbanks. 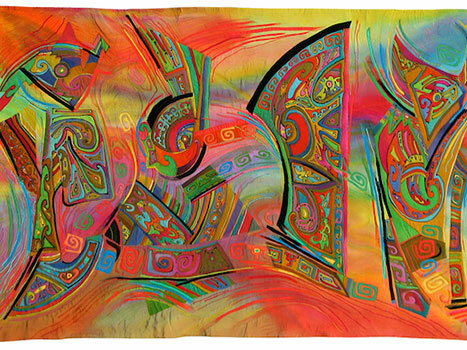 Her work is in the collections of the University of Alaska, Fairbanks Museum and the Alaska Contemporary Art Bank. She is a Juried Artist Member of Studio Art Quilt Associates (SAQA), a national art quilt organization. Sandra is also a member of the Art Quilt Association of Western Colorado (AQuA), Front Range Contemporary Quilters (FRCQ-Colorado), Fabric Arts Studio (FAS-Connecticut), and the Surface Design Association (SDA). Sandra's artwork is included in over ten national art quilt and fiber publications. A prospectus for this exhibition is available at https://www.suu.edu/pva/suma/exhibits/pathfinders.html.